Hopeman is a village on the north coast of Moray, some two miles east of Burghead and five miles west of Lossiemouth. From the road between them, you only glimpse the inland side of the village. 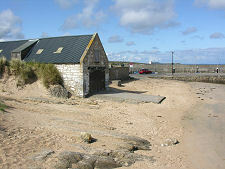 Hopeman itself comes with an attractive and complex harbour and two beaches. 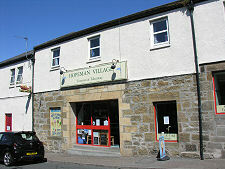 Hopeman was established as a planned village originally called "Newtown of Hopeman" in 1805 by the local landowner, William Young of Inverugie. 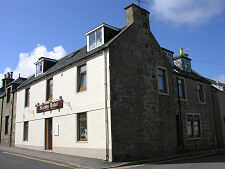 He had opened quarries at Greenbrae and Clashach to the east of the site of the village to extract the golden coloured sandstone found here, and he needed somewhere to house the quarrymen and their families. 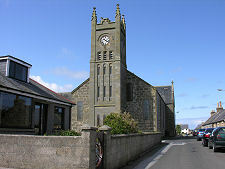 In 1836 the Inverugie estate, including the village of Hopeman, was acquired by Admiral Archibald Duff of Drummuir. Within two years he had built a harbour here, partly to allow the stone extracted from his quarries to be exported more easily, and partly to allow fishing boats to be based here, thus broadening the economic base of the village. By 1850 there were some 70 fishing boats using the harbour, each with a crew of six. By 1880 there were 120 fishing boats based at Hopeman, and five fish curing businesses operating here. 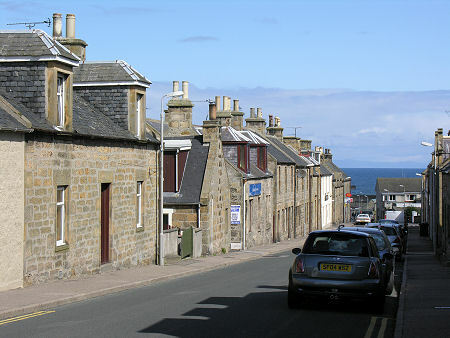 Such was the volume of business through the harbour at Hopeman that it was extended in the 1860s, and in 1892 the Highland Railway extended its branch line which previously terminated in Burghead by two miles to a station near Hopeman Harbour. The railway was never a great commercial success, and passenger services ended as early as 1931, with freight services also ending in 1957. 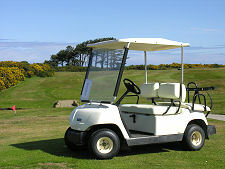 The Hopeman Golf Club was founded in 1923, playing on a 9 hole course to the east of the village. In 1985 it was extended to 18 holes, and claims to be one of the most demanding links courses in northern Scotland. 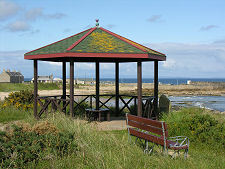 For today's traveller along the main road between Lossiemouth and Burghead, it is well worth making the turning into the centre of Hopeman. 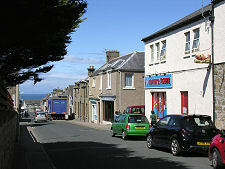 The main street, Harbour Street, slopes gently downhill and is home to a number of shops and a post office as well as the excellent Hopeman Village Tearoom & Takeaway. At the bottom of the hill is Hopeman Harbour. 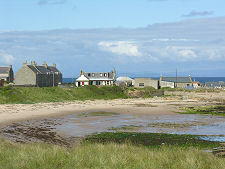 This was largely abandoned as a commercial fishing harbour following partial silting in the early 1980s: when Hopeman-owned boats moved along the coast to the harbour at Lossiemouth. 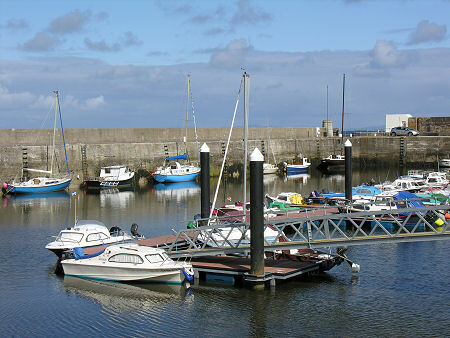 The harbour remains popular with small leisure craft, and it is interesting watching them negotiate the unusually complex arrangement of piers and breakwaters that form the harbour mouth. Either side of the harbour are beaches called, for obvious reasons, the East Beach and the West Beach. 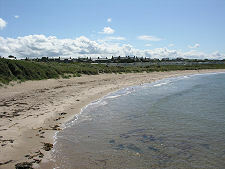 The West Beach is the sandier of the two, and is backed by a row of caravans placed between the shore and the village itself. The East Beach is a mixture of sand and rocky areas, and curves round to a rocky promontory. 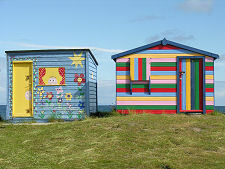 This beach is backed by what is these days something of a rarity: a line of beach huts, all individually and in some cases beautifully painted, plus a small pavilion.